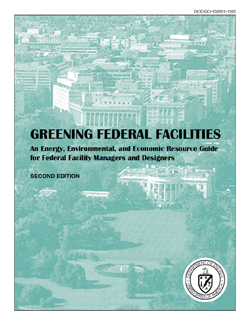 Greening Federal Facilities, Second Edition, is a nuts-and-bolts resource guide designed to increase energy and resource efficiency, cut waste, and improve the performance of Federal buildings and facilities. It is intended primarily for Federal facility managers, who administer more resources and have more impact on the environment than any other group in the world. Collectively, they are a powerful force for introducing improvements, and they set an example for the rest of the economy. This guide highlights practical actions that facility managers, planners, and design and construction staff can take to save energy and money, improve the comfort and productivity of employees, and benefit the environment. The guide is one more step in a national effort to promote energy efficiency and sustainable actions in the nation’s 500,000 Federal buildings and facilities.